Photo kindly supplied by Partick Hannay of Bangkok. 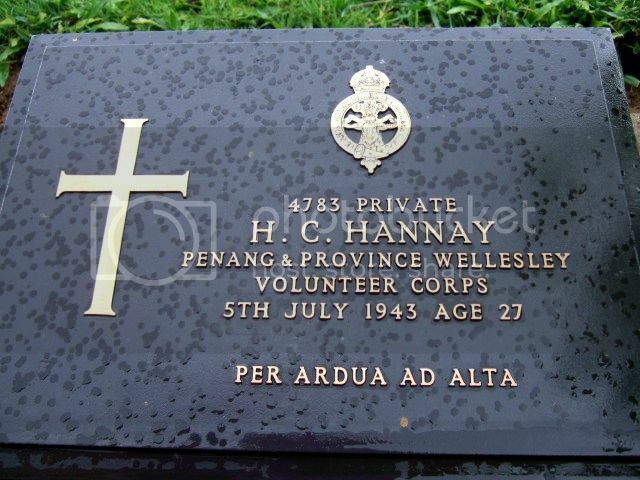 3rd (Penang & Province Wellesley Vol. Corps) Bn. Son of Harry Campbell Hannay. and Katharine Louise Hannay. Harry (junior) is listed on the Penninghame Parish War Memorial in Newton Stewart. Harry's mother was held in Changi Prison in Singapore. Her sons were in PoW camps in Thailand. Her husband, who was also held at Changi, and eldest son Edward (Ted) survived as did her daughter Mary who escaped via Java. Red Cross Nurse, Daughter of the late Charles Selkrig Taylor and Annie Taylor, of Edinburgh; wife of Harry Hannay, Mining Engineer, of Ipoh, Perak. Died of Dysentery in the Miyako Hospital, Singapore.